We offer fullboard progression kiteboarding camps for all men and women out there! With Oceanbirdz you get to explore kitesurfing in every different (wind) angle. We take you into the water at the most impressive windy destinations around the world. Our kitesurfing camps are suitable for every level, from beginner to advanced. We always include supervision and private coaching sessions for the intermediates and advanced kiteboarder during our (progression) camps. Thanks to our professional instructors, it is possible for beginners to learn kitesurfing quickly. For the advanced riders we offer trick clinics on different disciplines and personal one on one video analysis sessions. Of course we do all of this in a sociable, well insured and safe environment. Trust us, we are one of the only official licensed kite tour operators where we do that extra mile still with a huge smile! At oceanbirdz we are happy after a good session on the water; practice yoga or a crossfit work out in the morning to keep us fit; we enjoy relaxing at the beach in our vw camper Jet; drink a beer after a good wind day and for sure dreaming away in a hammock at the campfire during sunset. Our goal is to share those happy , for us daily, feelings with as many of our travelers as possible. And we must admit that we have become pretty good at combining all the ingredients to get the right vibe at our worldwide kiteboarding camps. Meet our main team bellow. We communicatie and coach in dutch, english, german and french. Ask any kitesurfer who has ever stood up on a kiteboard and they will tell you there is nothing like that first time. It is an incredible feeling you will never forget and one that can change your life. The same happens with any other type of board. Mastering these challenging skills will bring a lot of excitement. Not only from the pure joy when performing them, but also because of the self confidence you gain. Such moments make us realize that if we have the courage to try, there is much more we can accomplish just by believing in ourselves. With this in our mind, we started Girlzactive in 2014; a kiteboarding travel organization especially for women. Although kitesurfing used to be dominated by men, we are proud seeing more women on the water every time! After many requests during our world wide camps, we decided in 2018 to expand our team and business with our ‘brother’ Oceanbirdz. From now on Maroean and all her team members, will make it possible for men and women to join our famous well operated kiteboard holidays. Do you enjoy an adventure with likeminded, sportive travelers and an amazing crew? 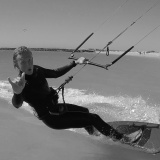 Be welcome to the world of our kiteboarding lifestyle, be welcome to Oceanbirdz.com. Take a look at the destinations for all our kiteboarding camps. We would love to take you out on the water to go kitesurfing! Hello! I’m Vera Klabbers. I grew up in a sporty family and got introduced with kitesurfing at a young age, my kite teacher was my own dad. After learning how to kite the virus hit me and it never went away again, I stopped all my other sports and started competing. 2014 has been a great year for me I got Junior World and European Champion. Now I am training a lot and im competing in the WKL senior world tour. For me kitesurfing is not just a sport, it's a way of living! Hanging out on the beach after a session share your passion with others makes me smile.I love to train with my brothers but besides that it’s also nice to be on the water with a lot of travelers enjoying the ride. I'm the youngster of the Oceanbirdz / Girlzactive team and will be there on the water to help you out with progression on every different level, looking forward to meet you! Hi! After traveling all over the world and being impressed by kite surfers ruling the sea, I decided to take my first lesson at the start of 2013. Shortly after this, I started wake boarding, long boarding and took my snowboard of the attic as well. After a lot of board sport travels, I finally decided to share my passion with others all over the world, graduated for my IKO and started up Girlzactive in Nov 2014, in 2018 we expanded with Oceanbirdz to make the family even bigger.I can write many stories on how great our sport is and what happens during our camps, but even more I’m looking forward meeting you during one of our events or trips so I can share my passion for board sports and the way of life that comes with it in person. 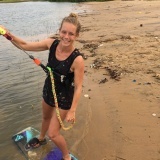 Meet Kelly Schouten; After being a professional runner for many years I was stuck on some level and decided kitesurfing would be a relax hobby to do next to that. Its now 10 years since than and I chase the wind and sun all over the world. But I have to say my competitive side didn't leave me completely. Thats why I have been competing at the European championship where I got 3rd, the Asian championship (2nd), the Dutch Nationals where I got 1st in 2014 and 2nd in 2015 and the Turkish Freestyle Cup where I became 1st in 2016! But what I love the most is the ride with others, learn from each other, motived each other, sit by the campfire, drink coconuts and share great stories about kiting (mine: ride with dolphins). With Oceanbirdz you will find me at the Progression Camps. Helping you to stick that new trick! See you soon.. 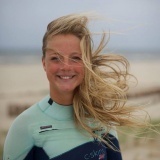 This curly blond surfer was born and raised in Yerseke, a small town in Zeeland. He spent his youth riding every kind of board you can imagine, skateboarding, longboarding and snowboarding. 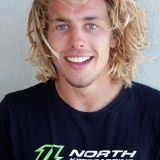 In his adolescence he learned kitesurfing within a day in France and after a few days he landed his first trick ever. A new addiction was born!Every single moment of spare time Sander was found on the water.After graduating school his real kite adventure began. Brasil, Cabo Verde, Europe, Morocco and Venezuela became his training destinations. Together with his girlfriend and in laws they travelled to Cabo Verde and here the idea of 4Wind kite school was born. Ever since Ronald and Sander are working hard to expand their dreams in being one of the best kite school on the Dutch coast. Next to 4Wind Sander became Dutch champion freestyle in 2016 and in 2014 he finished 3rd of Europe in the freestyle competition and also 3rd in course racing. You will find Sander on a regular base as a coach in one of our kite camps. And you’re more than welcome to take a lesson with 4Wind in Castricum during the kite season. As a young kid I spent every hour of the day on the beach, playing around in the water and with power kites. The day I turned 12 years old I had my first kitesurf lesson, and I was hooked! Whenever there was wind I was on the water. When I was old enough to start teaching I did, and I never stopped. After teaching for 10 kitesurf seasons, 9 winter seasons in skiing and 3 years at my own school; North Sea Watersports, I'm now also joining Oceanbirdz to share my passion for kitesurfing with you. See you soon on the water! Hey! Born and raised on the dutch coast close to one of the best spots in Holland. I grew up competing in sports, swimming, skiing and sailing. Soo salt water in my blood infected me with kitesurfing eventually. After high school I played professional rugby for several years till a knee injury forced me out of the game. I started to search for new thrills and luckily found it in kiteboarding. In big waves and strong wind you will find me my happiest. Oceanbirdz gives me the opportunity to combine my passion of traveling and kiteboarding. Hope to share this amazing sport with you in one of our upcoming trips.See you where the wind is!